Xmarks (Foxmarks) has announced it will cease operations by January 10th 2011. We recommend using Firefox Sync instead. For years I had many sets of bookmarks, one at the office, and one on each computer at home. I regularly copied bookmarks between them, especially when I got a new computer. But still the bookmarks on different computers grew apart. Of course there are many online social bookmarking services out there, and I tried some of them, but they lacked the convenience I wanted to add and organize my bookmarks and mostly it was not trivial to keep them private (they are social bookmarking services after all). In early 2006 I tried the Foxmarks extensions for the first time and found that it was exactly what I was looking for, a simple way to share my bookmarks amongst the computers that I use, without any undesired side effects. I am still using it today. To use Foxmarks, all you need is to run Firefox and install the Foxmarks extension. 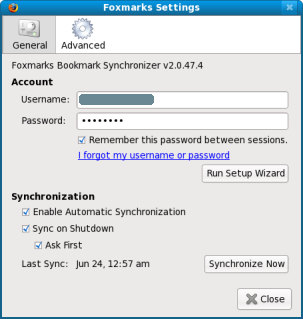 Once installed, the setup wizard will help you create an account on the Foxmarks server and upload your initial bookmarks. If you are installing Foxmarks on a second or third computer just indicate during the setup process that you already have an account and let Foxmarks synchronize your bookmarks with the ones you already uploaded. The Foxmarks server functions as the central repository to and from where Firefox will upload and download your bookmarks and as a result you always have a backup of your bookmarks online. At any time you can go to the Foxmarks settings menu in Firefox, which you can find by clicking on the Foxmarks icon in the status bar, or under the Bookmarks menu in Firefox, or by hitting ctrl-shift-F. In the settings menu you can set your userid and password, choose for automatic synchronization and synchronization at shutdown or manually initiate synchronization. You can also initiate synchronization of your bookmarks with the ctrl-shift-S key combination. Tip: Besides sharing bookmarks between your work and home computers, you can also share bookmarks across different operating systems, as Firefox and Foxmarks run on Windows, Mac and Linux. This is also practical if you have a dual-boot system, you can have the same bookmarks under Windows as you do under Linux (as I do). And last but not least, when you buy a new computer all you need to do to get your bookmarks on them is install Foxmarks and enter your account details. In addition to synchronizing your bookmarks across all your computers, you can also access your bookmarks online, through myFoxmarks, from anywhere in the world. Which can be practical at times. The myFoxmarks site, also has handy tools to manage your bookmarks. Besides editing, deleting and creating new bookmarks, you can drag and drop bookmarks and folders and there's a preview feature. There is a search feature to search within your bookmarks, tools to explore and restore old bookmarks, the possibility to import bookmarks from del.icio.us and share your bookmarks with others. If for privacy reasons you prefer not to upload your bookmarks to the Foxmarks server, you can use your own server instead. Go to the advanced settings tab enter the URL for your server. Note that you will not be able to use the myFoxmarks online service if you use your own server. You can use any server on the Internet, in your office or at home as the central system on which to store your bookmarks, as long as you have an FTP or WebDAV server running on it. So you can set Foxmarks up in such a way that your bookmarks stay on systems you control but still benefit from the ease of sharing them between many computers. 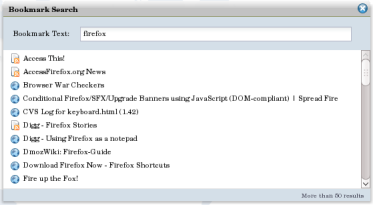 Install the Foxmarks extension from the Mozilla add-ons repository. Find out more on the Foxmarks homepage. If you encounter any problems check the User Support wiki.